Last year, we moved into a new neighbourhood, and had the typical North American experience of trying to find our place in the neighbourhood, struggling to make up excuses to introduce ourselves. I think there is general agreement that the sense of community has been degrading over the past few decades, maybe as we move to bedroom communities or the ever looming issue of stranger danger that started when I was a kid and hasn’t slowed down. During this time, and throughout my PhD work, I’ve been thinking a lot about social connections. I want to understand how digital products can create real world social experiences. A good example of this is Kijiji or Craigslist. The digital experience of posting an ad, and then others browsing the ads, takes the transaction offline. Kijiji is only the digital connection between the two people; the actual communication happens over phone or email. In the end, the digital post turns into a real world transaction, with people meeting at each other’s houses or public parking lots. How can we design digital systems that will create real world connections? To tear down some of the barriers of creating real world connections, systems should first focus on local connections. Kijiji uses city-based posting, so the ads you see are within a short drive of your house. I think this city-based granularity works for transaction-based systems like Kijiji or Craigslist, but hyper-local social discovery may be better for one-to-one connections. By hyper-local, I mean in the immediate vicinity (think on the same block). People around you, on the same block, are likely to have a lot in common with you. These are your neighbours, the people eating at the same restaurant, and the people in the same dog park. The fact that you are both at the same place means you share an interest in that location; it’s at least an icebreaker, something I think many of us are looking for. Enter Click, our first hyper-local social network. Click works at a ‘location’ level, allowing you to check in to businesses and venues, but only when you are actually there. 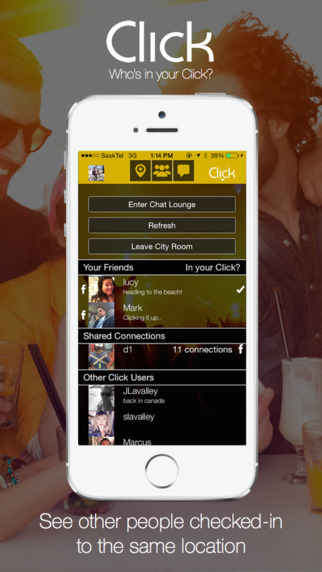 Within each location, there is a location chat lounge, where you can meet new people in real time. Not only do you have a shared interest with these people; they are actually here, right now, waiting for real-world social connections. 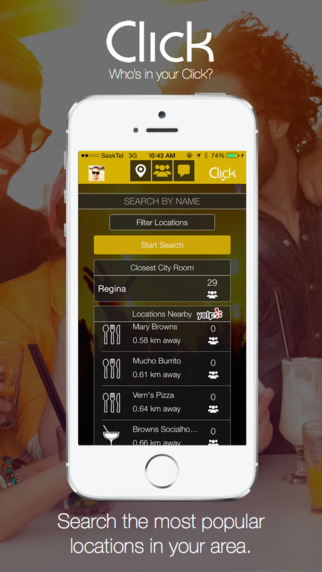 Click is now live on the iOS app store, with an Android version currently in development. Start Clicking today!